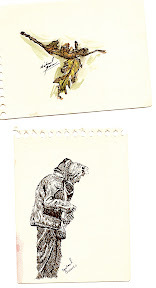 Doing some cleanup of my office at home and ran across these small sketches (they are about 4"x5" sheets). I turned these in to Mr. Pullen (my HS art teacher) for a couple of weekly drawings. I wonder what happened to all the rest of 'em? I can remember creating these - it's amazing that was as a freshman in 1989. According to the note on the opposite side of the elderly woman, I turned her in on 12-10-89. I also stretched the estimate and said it took me 45 minutes to create. Sorry! You should frame them. Especially the leaves, they are really great. I can almost draw a perfect circle; sometimes. Wow! you have been talented your whole life, haven't you, honey! I can almost draw a perfect square... :) Yes, we should frame these! Let's see some more of your sketches from years past! These are WAY better than anything I ever handed in... Mr. Pullen probably laughed hysterically when he saw my weekly drawings! I can still remember a couple of mine... a shampoo bottle and the cover of a Steve Miller Band CD. And if it makes you feel any better, I "stretched" my time too. Thanks all. margaret, I know there were some real winners in my collection too - maybe that's why I only have these 2 wee bitty ones left to hold on to! I do have some "raku" fired pottery from senior year that I still like on my desk. Fun times!